The biggest Albanian cinematographic event of the year! 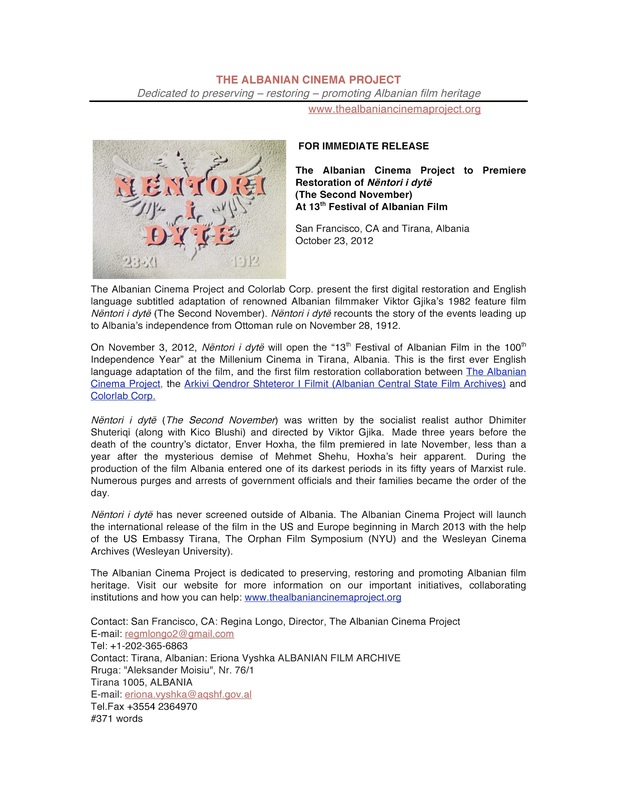 PERfACT had the opportunity and pleasure of talking to Regina Longo, Director of The Albanian Cinema Project, about this great initiative, the upcoming World Premiere of the restored Albanian film Nentori i Dyte on Saturday November 3rd in Tirana and much more. Regina Longo teaches in the department of Film and Digital Media at the University of California, Santa Cruz. She specializes in archival theory and practice, international documentary film history and Italian film and cultural studies. Regina is also a professional film and media archivist, who spent six years at the United States Holocaust Memorial Museum (USHMM) in Washington, DC, restoring and reconstructing the outtakes of Claude Lanzmann’s Shoah. While at USHMM she also shepherded the acquisition and preservation of the "Julien Bryan Collection." She received her PhD from the Department of Film and Media Studies at the University of California, Santa Barbara and has published articles in The Journal of the Moving Image, Screening the Past and California Italian Studies. Regina serves as Special Consultant to the Albanian Film Archives and is the Director of the Albanian Cinema Project. Why Albania? How did this project come about? The project came about as a result of a conversation that I had with a colleague, film producer Thomas Logoreci, who is an American of Albanian descent. He used to live in San Francisco, where I currently reside, and he now lives in Albania and is married to Albanian filmmaker Iris Elezi. Thomas teaches at the Marubi Academy in Tirana (the film school started by Kujtim Cashku, that is located on the grounds of the old Kinostudio right next to the archives. Thomas has worked with the AQSHF to present screenings and as part of the DokuFest programming team. Thomas was in San Francisco for work, and he got in touch with me to ask if I had any advice on how to manage the problems that the AQSHF was currently experiencing. The staff at AQSHF have been doing everything they can and know what the problems are, but the Albanian government does not allocate sufficient funds to the archives to make the changes they need to make to save the film collections. This is a problem everywhere in the world, and not just Albania, government funds for cultural heritage are often scarce. I am a professionally trained archivist and I used to work for a US government archive, The Steven Spielberg Film and Video Archive of the US Holocaust Memorial Museum. So, I volunteered to help the AQSHF by providing their staff with some consultations at a distance (e-mail, Skype) and I began organizing to have some supplies sent to them. Then, in the summer (July 2012) I had the chance to visit and see things first hand and began collaborating with the staff of AQSHF to try to do more to help the archives. The project and the team grew quickly and now we are ready to launch our first restoration project in Tirana. In addition to being a film archivist, I am also a film historian and I teach film history at university. To me, the idea of an entire national cinema (Albania) being absent from film history books and film history course was and is inexcusable. Albanians want their film history to be known outside Albania, but it has taken time to organize other aspects of the country and government post 1990s to allow Albanians the time to shift from rebuilding a country after regime change to safeguarding and preserving the country's cultural history. The time is right now to bring Albanian films back out of the archives, and to show and tell the stories of how Albanian cinema intersects with the film history of the rest of Europe and with China and beyond. After my visit in July I also made a report to Aldo Bumci, Albanian Minister of Culture to let him know that we were very serious about making this project work, and he has been supportive. That's a diverse group of people. How did you all work together to make something this special and significant for Albania? As I mentioned, I have been working in the profession of film and media archiving since 1998. The international community of film archives and film archivists is a small, close-knit community. Of necessity, because as I mentioned in response to your first question, many governments throughout the world do not have sufficient funds to help support and save their cultural heritage. So, international groups of archivists are often in contact with each other to support each other's work. To be in this field, you must have a passion for moving images and an understanding that no one does this work to get financially rich. The riches that come from saving our cultural history are different kinds of rewards, and because of this, there is deep respect across national and political boundaries that does not exist in some other professions. I called on friends and colleagues that I had collaborated with in the past, I explained the situation that exists currently in the Albanian archives and everyone I asked to join the team agreed to help without hesitation. As I mentioned, the passion for preservation is a at the core of any individual working in this profession, and I also had a history of doing good and positive work with these people, we have a relationship built on mutual trust and respect, and that is how we are building this project, with mutual trust and respect of all involved parties. Everyone is giving of their time, and their specific expertise to help this project grow and be successful. How long does it take to fully restore and translate one of these films? The first one is 'Nentori i Dyte' right? Yes, the first film that we chose is Nentori i Dyte. This title was suggested by former director of AQSHF Artan Minarolli. It is historically significant for many reasons. It is directed by renowned Albanian filmmaker Viktor Gjika, it retells the story of Albanian independence from Ottoman rule, it was in need of preservation and it had never been screened outside Albania and never in a foreign language. We know that the only way that people will begin to appreciate Albanian cinema is if they can see and understand the films, so we are making that happen. The restoration process is a long one. We are just finishing the first digital phase of the restoration and we will show a digital projection in Tirana this week. The costs are quite high, so for reasons that have to do with cost and with technology we are completing this restoration in stages. First of all, the work to translate this 84 minute film from Albanian into English and to create an accurate English language adaptation was a VERY time consuming process. We had 4 people on this team-- 3 native Albanian speakers and one native English speaker. It took almost one month to get it just right, and many, many sleepless nights. We were working on a very tight schedule since the film elements were shipped to the film lab (Colorlab Corp) in Washington, DC in late August and we knew we had to have everything ready to ship back to Tirana by Oct. 29th. While the team in Tirana was working on the translation for the subtitles, the team in Washington, DC at Colorlab was examining by hand every reel of the original camera negative, every reel of the original sound negative, every reel of the projection print that currently exists for the film (all shipped from AQSHF in Tirana) and they had to repair any damage to the reels, check for the color balancing, check for fading, check the soundtrack for kinks, glitches, etc. Once the work of hand inspecting all the reels was done. The work of scanning the original negatives (picture and sound) into the 2K digital scanner required a number of tests of workflow, and so on .This part of the work took another month to complete. Then, it was time to lay the subtitles onto the digital file for the restoration, and this required a native Albanian speaker to be on site at the film lab in DC for two days of work to make sure that everything was timed perfectly on the film. How much does it cost to make this happen? Right now, after 2 months of hard work, the cost for the digital restoration is $20,000 US dollars. We are still working to raise this money to pay for this restoration. In order to make a full preservation on this film. By full preservation for the archives community, this means if something originates on film, you want to preserve it in that original format. 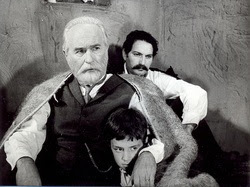 So, to make a full film restoration and produce a new, subtitled film print for international distribution (this is our goal for March 2013) will cost $35,000 US dollars. The total cost of the digital work and the film work is $55,000 US dollars. This type of work is very expensive, but we still believe it is worth it to give Albanian cinema its rightful place in international film history. How many more films are you working on and would like to restore? And yes, we do have plans to work on other films, the second, and one that is also not so old (in years) but that is in very bad need of preservation and restoration is Kujtim Cashku's film Balle per Balle (Face to Face 1979), and the plan is to work on Fortuna (1958) after that . Both Balle per Balle and Fortuna have original camera negatives and prints that are in terrible condition, with color fading and problems that occurred during the original film processing. These films will require much more work than what we had to do for Nentori i Dyte, which was faded and had sound track problems, but nothing near the issues that we have with Balle per Balle and Fortuna. I know and have talked to many individuals that love the project and are interested to help and encourage its continuation. How and where can they donate? Every little bit helps, we are all donating our time and energy now-- but the lab work costs money and this cannot be done for free, so please every little bit helps! 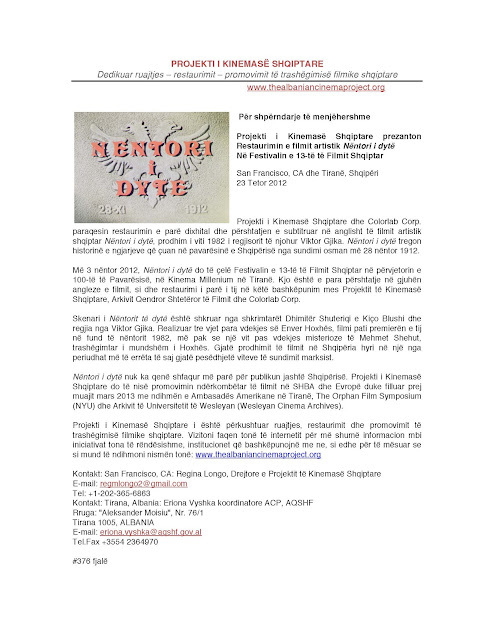 You're about to screen 'Nentori i Dyte' in Albania, the first and the most anticipated film of the initiative. 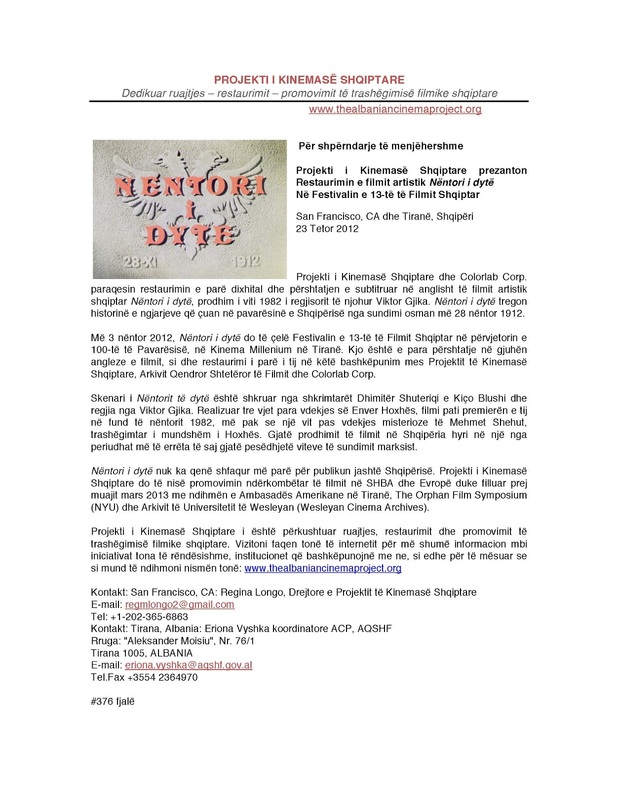 It's the 100 year independence and this project takes a very significant role in preserving the Albanian cinematographic heritage. What are your expectations? We are very excited about this. In addition to being the opening night film for the 13th Festival of Albanian Film in the 100th Independence Year, we are excited that an international audience will be able to see and understand this film for the first time with English language subtitles. We think it is very important that the first international audience that sees this film sees it in Albania. We are also very excited that the Director of Photography for the film is flying in from his current home in Italy to take part in the event, and that others who were part of the film crew and cast will be in attendance too. The Director of Photography's name is Lionel Konomi. As you know, the film's director, Viktor Gjika is one of Albania's most important and known filmmakers, and that he ran the Albanian state film studios for a part of his career. We hope that by introducing our project with this film that we can begin to reopen a dialogue in Albania about Albanian cinema. Nearly 20 years have passed since the fall of the regime, and many of the films we will work to restore were made under a regime that was feared and not universally loved by Albanians. So, we know that it is difficult for Albanians to look at some of this history on the big screen. But, we also know that, as is often the case with totalitarian regimes and artists working under such regimes, that the messages that artists were asked to deliver and those that they did deliver to the public through their films and stories were not always what the regime expected or wanted. For this reason, by re-examining these films, we believe that Albanians and the rest of the world will begin to see the value in preserving, restoring and re-examining the role of media in creating, upholding and yes, even changing civil society. I worked for many years as the film archivist at the US Holocaust Memorial Museum, and preserved hundreds and hundreds of hours of footage that represent some of the darker aspects of our humanity. The necessity for doing this was always quite clear, if we are to grow as human beings and to come to terms with our past in order not to repeat it, we must be willing to face it and to acknowledge the many shades of gray and many colors that make up our history. It is never an easy task to do this kind of work, but keeping the conversation going is the only way to continue to work for positive change. What we most expect and desire from this restoration and first public screening is a chance for Albanians to get this conversation going and to open up a dialogue with the larger international audiences that we know eagerly anticipate the chance to see this film, and many other Albanian films. Thank you for taking the time to talk to us and I'm looking forward to the screening of this film and many others to follow. For more information about this incredible initiative check out The Albanian Cinema Project website, their Facebook and Twitter accounts, and please don't forget to DONATE.